What's it about? Due to some rather vague and hand-wavy science, scientist James Franco has increased the intelligence of some chimps in his laboratory. Rather unethically, he takes a baby one home with him, names him Caeser and watches him grow into a very smart ape indeed. Which is a bit of a problem when Caeser starts to realise humans are really quite a bunch of bastards and starts plotting an uprising. I'm Spartacus! Er...I mean Caeser. Is it any good? Essentially it's a furry version of Spartacus, in which Caeser rises to the position of warrior leader, unites his fellow apes and inspires them to rebel. Prior to this, though, you'll have to sit through some dodgy meddling-with-science exposition and a slightly clunky slice of family drama (with a chimp instead of a child), which doesn't quite deliver the emotional edge it promises. After that, though, it gets down to (monkey) business, throwing in reliable crowd favourites such as a tense prison break, a climactic showdown and a gorilla attacking a helicopter. Predictably, the most impressive thing about it is the remarkable CG effects (see clip below), with Andy Serkis and his motion-capture team breathing life into the simian characters to such an extent that their human counterparts are rather dull and wooden by comparison. No wonder we're firmly on the side of the apes throughout. Elsewhere, there's some nice nods to the original (and still the best) Planet of the Apes and whilst this film has nothing to match the allegorical power of that film, it's still a fun blockbuster, despite its flaws. I don't trust you. What do others think? 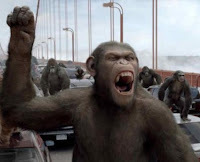 Memories of Tim Burton's lamentable Planet of the Apes remake in 2001 meant hopes weren't high, but both critics and audiences have been pleasantly surprised and good word-of-mouth has made it a success at the box office. Then again, everyone loves a good underchimp film. Also, don't be surprised to see a big push for Andy Serkis to be nominated in the acting categories come awards season. Anything else I should know? Don't leave too early at the end - there's a little bit of extra story during the credits which builds upon what has happened in the film, which helps explain how a few hundred apes could take over the planet from 6 billion humans. If you want to see how exactly this film fits with the chronology of the other five films in the series , you can check out this handy guide. What does the Fonz think? The Apes of Wrath - Hail Caeser!